SMEs had a combined turnover of £1.8 trillion last year. Firstly, thank you for taking your time to have a look at what we do. We began the SME4Labour group because we firmly believe that small businesses play a crucial part in British society and have a lot to contribute to progressive politics. I am a small business owner and a proud Labour Party member. Despite what some people think, these two things go hand in hand. I began my working life as a waiter. Over time, I worked my way up to become a manager before setting up my own restaurant in 2005. I now run 5 social enterpries alongside restaurants in London and employ 60 people. There seems to be an idea that the Labour Party is anti-business. In my opinion this could not be further from the truth. The Labour Party understands that SMEs are the lifeblood of our communities, as most businesses create jobs and reinvest in their local areas. I have personally borne witness to how much Labour MPs place value in the businesses in their constituencies. Recognising the importance of micro-business by pushing for a dedicated shadow minister and local council leader for this group. Catalysing start up growth through investment relief; using unused council property as start-up hubs; reducing red tape and providing greater practical support; and enabling greater access to sectoral business mentors and advisers. Expanding the reach of small businesses by pushing the government to help SMEs access international markets too often dominated by bigger organisations. Deepening the partnership economy by developing the same links big business has built with educational institutions to connect SMEs with schools. Small and medium-sized businesses, the backbone of the British economy, are an evergrowing cohort of constituents for every MP across Britain. Their needs are unique and varying depending on the nature and size of their business. Labour, the party of small and medium-sized businesses, is on their side. Why Small And Medium Enterprises (SMEs) For Labour? mall and medium-sized businesses are the backbone of the United Kingdom’s economy. As of 2017, SMEs made up over 99.3% of all private sector businesses in the UK. ere were 5.7 million SMEs in the UK in 2017 and total employment in SMEs was 16.1 million, which is 60% of all private sector employment in the UK. 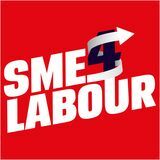 SME4Labour seeks to strengthen the relationship between small, medium, micro, and family-owned businesses with the Labour Party. We support constructive and informed discussion with the Labour movement on issues impacting SMEs. Through SME4Labour, we want to provide a forum where SMEs can work in partnership with the Labour Party and continue to inform the debate around our economic policies. We work closely with trade unions, employers groups and individuals, encouraging strong partnerships and collaboration. We organise meetings for Labour parliamentarians and others so that a greater understanding of the challenges faced by SMEs can be gained. Standard membership: For invitations to our events and a say in how SME4Labour is ran, £15/yr Concessionary membership: For members of Young Labour (under 27), students and retirees who support our cause, with the full benefits of standard membership, £5/yr CLP group membership: If your Constituency Labour Party can put together a group of 5+ party members who wish to join, you can pay together and we will knock off the price of one standard membership in addition to any concessions. 10+ members and we will knock off the price of two memberships. We rely on our members and the generous donations from our supporters to allow us to continue doing what we do. To join SME4Labour or make a donation, please go to www.sme4labour.org. Alternatively, you can request an application form by emailing: info@sme4labour.org. Get 10% discount every week! 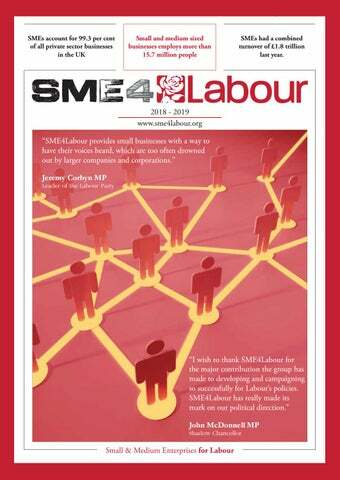 “SME4Labour provides small businesses with a way to have their voices heard, which are too often drowned out by larger companies and corporations. I’d like to thank and congratulate my colleagues in the SME4Labour team for their contribution to an economic policy that works for the many, not the few.” Speaking at the awards, Ibrahim Dogus, Co-Chairman of SME4Labour, said: “When we win, SMEs and the self-employed will be at the heart of Labour’s programme, because they mean so much to the future prosperity of the country. I am delighted that SME4Labour is playing its part. We have exciting plans for next year, and I hope you will join with us.” The event was kindly sponsored by First Premier, Bira London, Cobra Beer and Cheviot Capital. Presenters of the event were Cllr Aysha Raza of London Borough of Ealing and Author, NHS Campaigner and Disability Spokesperson Jos Bell. Entertainment was provided by musician Paul Stanworth, accompanied by Andrew Hyldon, and singer Hadis Ayoubi, accompanied by her band. SME4Labour relies on the kind donations of it supporters to continue to do its work. Please consider making a contribution. of the Communication Workers’ Union (CWU); Doug Nicholls, General Secretary of the General Federation of Trade Unions (GFTU); Mick Whelan, General Secretary of the Associated Society of Locomotive Engineers and Firemen (ASLEF); Simon Dubbins, Director of International & Research at Unite the Union; Labour Party Chairman Ian Lavery MP; Shadow Minister for Business, Energy and Industrial Strategy Bill Esterson MP; Shadow Secretary of State for Health Jonathan Ashworth MP, Shadow Secretary of State for Northern Ireland Tony Lloyd MP; Shadow Minister for Justice Gloria De Piero MP; Jo Stevens MP, Chris Peace PPC and Shadow Minister for Education and Children and Families Emma Lewell-Buck MP. businesses. Referring to the Sainsbury’s and Asda merger and the Carillion scandal, he argued that the suppliers are the ones that suffer the most as they lose money and business on unfair terms. He pointed out that the current Tory government is not implementing any measures to protect small businesses. He added that the Labour Party listened to SMEs across the country and produced policies that will provide fair markets, not just free markets. be lost due to the level of technological change over the next 20 years. He added that the number of freelancers is on the increase and that Labour must support this growing force of work. Mr Leong also urged the Labour Party to welcome more and more business people to the party and encourage them to stand in local elections as, he argued, local governments lack business people and they are therefore weaker in terms of introducing business friendly provisions. SME4Labour AGM 2018 Date: 18th of April 2018 Speakers: Jack Dromey MP, Ibrahim Dogus Chair: Rehana Ameer Committee Room 6 of the Houses of Parliament. n Tuesday the 18th of April, SME4Labour held its Annual General Meeting in Committee Room 6 of the Houses of Parliament. The evening began with a brief introduction from the chair and member of SME4Labour’s executive committee Rehana Ameer. This was followed by remarks from Shadow Pensions Minister Jack Dromey MP, who kindly hosted the event, and spoke passionately about the importance of the small business community, the work SME4Labour was doing, and the Labour Party’s role in championing SMEs. SME4Labour Co-Chair Ibrahim Dogus then gave a brief report outlining what had been achieved over the last year, noting that SME4Labour had held roughly one meeting every month that had sought to bring together figures from the Labour Party with small business owners and the self-employed. This included notable events at parliament and Labour Party conference. Mr. Dogus also gave a brief outline of SME4Labour’s financial situation, which continues to be healthy. Following the annual report, the meeting moved to elect an expanded executive committee of 29 members. In total, there were 27 nominations to the executive committee. They were elected unanimously, with the committee mandated to find suitable candidates to fill the remaining vacancies. The members of the executive committee are as follows: • Aliur Rahman, Chief Executive of the London Tea Exchange • Doug Henderson • Claire Johnston, Director Lion Communications and Events • Simon Lydiard, Former Senior Civil Servant and Director Breaking Barriers innovations • Mike Hedges, Taxi Driver and Chair of Unite London and Eastern Political Committee • Ibrahim Dogus, Chair of British Takeaway Campaign • Cllr. Haydar Ulus, Founder of Ulus Group • Rehana Ameer, Chief Executive of Prosap Corporation Limited • Paul Cons, Managing Director of Konditor and Cook • Cllr. Guy Nicholson, Chair of the Group Board at Newable • Martyn Davis • Raife Aytek, Restaurateur • Andrew Pakes, Director of Communications & Research at Prospect • Mike Joslin, Founder of Write You Media • Cllr. Jack Hopkins, Director of Good Planning • Cllr. Ali Gul Ozbek, Owner of Med-Chem Pharmacy • James O’Keefe, Executive Director at Quatro Communications • Callum Anderson, Policy Adviser at the Quoted Companies Alliance • Sen Kandiya, Director of Lyca Health • Shahin Rahman • Cllr. Beulah East • Rezaul Hai, Chief Executive of the Centre for Interactive Education • Sonny Leong, Executive Chairman of Academy for Parliamentary & Policy Studies • Martin Howe, Founder of Howe+Co Solicitors • Mark Glover, Founder of Newington Communications • Cllr. Paul Dimoldenberg, Executive Chairman of Quatro Communications • The meeting ended with a discussion on how best SME4Labour can move forward. n Monday the 5th of March 2018, SME4Labour held its 2nd annual parliamentary reception in the Jubilee Room of the Palace of Westminster. SME4Labour works to bring together small business owners and the self-employed with members of the party at all levels, and the room was packed with people from small and medium sized enterprises (SMEs) and the Labour movement. This included many Labour councillors, peers and members of parliament, alongside a variety of entrepreneurs, trade unionists and community activists. Shadow Minister for Small Business Bill Esterson, who kindly hosted the evening in parliament, spoke passionately about the issues facing SMEs and how a Labour government would take action to help them. His comments were echoed by Shadow Minister for Industrial Strategy Chi Onwurah, who detailed the policy measures being developed by the Labour Party, including a series of regional development banks. She was followed by Shadow Secretary of State for Work and Pensions Debbie Abrahams, who spoke about the work she had done to tackle the damage done by late payments to small businesses. Shadow Treasury Minister Anneliese Dodds then gave her family’s own experiences of running small businesses, and emphasised the need for tax reform to level the playing field with larger companies. Deputy Mayor of London for Business Rajesh Agrawal elucidated on the efforts being made to support SMEs by the local administration in London. While a London regional organiser for the Labour party, Kat Fletcher, issued a rallying call ahead of the local elections, asking business people to get involved in the campaign. Education Union Kevin Courtney added the voice of the trade union movement, with comments criticising the government’s cuts to education and the need for further investment in education to provide the skills and training necessary for a successful economy. A point that was also made by Hannah Reed, Senior Employment Rights Oﬃcers at the Trade Union Congress, who said that it is the economy that benefits most from a close working relationship between businesses and unions. was the natural home for SMEs. In particular, he criticised the government for “being in oﬃce but not in power”, saying that the legislature was paralysed by Tory infighting over Brexit while the rest of the country continued to suffer the devastating effects of austerity. He called on Chancellor Phillip Hammond to use the Spring Statement to invest in the future of the economy, and in particular to help local councils crippled by cuts to their budget. The evening ended with a networking reception, with the room buzzing with ideas being discussed and connections made. ness and the businesses of fellow jewellery makers face. These include the VAT threshold, which can deter some businesses from expanding, and issues around competitiveness and the costs of imports. Simon Lydiard, recently retired from the civil service, expressed concern that the big consultancy companies dominate Whitehall, locking out SMEs from key decision making. He said that the Coalition and Tory governments have had “no vision” to offer SMEs, just targets. Mr. Lydiard praised John McDonnell, saying he is one of Labour’s best media performers in his role as Shadow Chancellor, arguing for an economy of sustainable investment and inclusive growth. In the roundtable discussion after our panelists’ speeches, we discussed how to talk to voters about business on the doorstep, how to challenge old prejudices about Labour being ‘anti-business’, how we should challenge the idea that small business and big business’ interests always align, and why we should be championing good practice among businesses. you didn't go ry about printing. otional needs large and small, with express turnaround or economy service. flyers, folders, invitations, leaflets, letterheads, menus, posters, tote bags, T-shirts, and more. nt.co.uk for our best deals: iscounts not available to the public. ase ask for Labour Party campaign rates. ME4Labour held a fascinating forum in Westminster on the Taylor Review into modern employment practices. Commissioned and endorsed by the Prime Minister, in July Matthew Taylor published his far-ranging review into modern work. Covering everything from zero-hours contracts to reforming employment law, the report has provoked significant debate.The event was kindly hosted by Bill Esterson MP and chaired by Philip Ross of Labour Business. Speaking at the event were Jack Dromey MP; Simon McVicker, Director of Policy and External Affairs at the Association of Independent Professionals and the SelfEmployed (IPSE); Hannah Reed, Senior Employment Rights Oﬃcer at the Trade Union Congress (TUC); and Mark Glover, Founder and Chief Executive of the communications consultancy firm Newington. Review author Matthew Taylor of the Royal Society for the Encouragement of Arts, Manufactures and Commerce (RSA) joined us in the second half of the session to discuss his report and to address some of the criticisms that have been levelled against it. Chair Philip Ross asked how should Labour respond to the changing workplace landscape, highlighting the positive use of ‘worker-tech’ in the Taylor Review and its potential to assist in organising the selfemployed. Host Bill Esterson MP briefly spoke about his background in small business and said that Taylor was asking the right questions, even if not everyone agreed with all of his solutions. company Newington’s work with taxi drivers in their struggle against Uber. Echoing Reed, Mr. Glover said that companies like Uber were less about technological developments and more about old fashioned exploitation and bosses cutting corners. He stated that “flexibility is used as an excuse for poor pay”, and highlighted issues such as tax and social profits. Matthew Taylor said that he aimed to “nudge rather than shove” – so, for example, the review recommends a higher minimum wage for non-contracted hours (a “nudge”) rather than abolishing zerohour contracts altogether (which would constitute a “shove”). This, he said, would stop bosses shifting risk onto vulnerable workers while maintaining flexibility and dynamism in the economy. He argued for the right to request a permanent or fixed contract and transparency around the labour supply chain and criticised certain industries, giving the example of road haulage companies, where workers are vulnerable and exploited with bogus selfemployment. Do you have a Plan B For Your Health? We connect patients from all over the world with the right doctors in different countries, we carry out all communication studies in the target markets of health institutions. Share your health details with us is enough…. During the course of your treatment, we are by your sides at every turn with expert advisors who speak your language. ME4Labour in partnership with LabourList, hosted an event at Labour Party Conference in Brighton entitled ‘Labour’s links with SMEs: building a pro business reputation’. SME4Labour Co-Chair Ibrahim Dogus was joined by Stephen Kinnock MP, Bill Esterson MP, Lola McEvoy of the Living Wage Foundation, and Labour Business Chair Hamish Sandison. Bill Esterson MP kicked off the event, making the case for Labour as the party of small business. He spoke of the real uncertainties around Brexit, but stated that Labour is leading the way while the Tories dither and divide on the issue. He argued that Labour’s manifesto was clear in its support of SMEs. SME4Labour Co-Chair Ibrahim Dogus followed, arguing that we need to invest in SMEs to boost the wider economy. He made the case for greater innovation and that this has been stifled by years of Tory economic neglect, arguing only Labour has the ambition to embrace changes in the economy in a progressive way. facturing revolution and build a new kind of inclusive growth. Hamish Sandison closed, arguing that we have to bust the myth that the Tories are a pro-business party. He said that Labour’s excellent policies on health and education are also attractive for businesses – businesses thrive with healthy, productive, well-educated workforces. ME4Labour held a roundtable discussion in the House of Commons on the role of SMEs in the British economy after Brexit. The event was chaired by Simon McVicker, Director of Policy and External Affairs at the Association of Independent Professionals and the Self-Employed (IPSE), and featured keynote speakers Stephen Kinnock MP and Martin McTague, National Policy Director of the Federation of Small Businesses (FSB). Stephen Kinnock MP opened by speaking of the increasingly symbiotic relationship between politics and business, and how changes in the political landscape with Brexit would impact upon SMEs. He remarked that the big FTSE100 companies had their voices heard during the referendum last June, but that SMEs – whose voices would have been more relatable to ordinary voters, and whose interests differ to those of big business – were side-lined during the debate. whether politics would trump economics in the EU’s thinking with regards to a deal with the UK. He also said that Labour’s General Election manifesto contained some great ideas for SMEs - in particular the £250 billion transformation fund - and that he is currently endeavouring to build a cross-party “coalition of common sense” around Brexit with MPs from other parties. General Election 2017 Small Business Debate Date: 18th May 2017 Host: Emma Jones Speakers: Matt Hancock, Ibrahim Dogus, Lord Monroe Palmer, Rachel Collinson, Ernie Warrender. ME4Labour Co-Chair Ibrahim Dogus took part in the General Election Small Business Debate, organised by Enterprise Nation. The debate was lively, with Mr. Dogus sharing his perspectives with the other participants and hearing the questions and concerns of the audience. Mr. Dogus was joined on the panel by Matt Hancock, former Digital and Culture Minister and Conservative member of parliament for West SuďŹ&#x20AC;olk; Lord Monroe Palmer, Lords Spokesperson for SMEs for the Liberal Democrats; Rachel Collinson, Green Party Spokesperson for Business; and Ernie Warrender, Spokesperson for Small Business for UKIP. The event was hosted by the founder of Enterprise Nation, Emma Jones. n 6th December, SME4Labour launched the Labour Campaign for Gambling Reform (LC4GR). The event was hosted and chaired by Carolyn Harris MP, chair of the APPG on fixed-odds betting terminals (FOBTs). See was joined by Jo Stevens MP and Matt Zarb-Cousin, spokesperson for the Campaign for Fairer Gambling and former spokesperson for Leader of the Labour Party Jeremy Corbyn. The event was attended by many including people with first-hand experience of the dangers of gambling addiction. attendance included Rebecca Long-Bailey MP, Seema Malhotra MP, Jim Dowd MP, Toby Perkins MP, Jess Philips MP, Sharon Hodgson MP, Ian Lucas MP and Catherine McKinley MP, attesting to just how crucial the meeting was. ME4Labour organised a roundtable meeting involving MPs Chuka Umunna and Bill Esterson, attended by an audience of small and medium business owners. It was hosted in Committee Room 19 of the House of Commons and chaired by Ibrahim Dogus. Chuka Umunna MP opened by firmly restating Labour’s commitment to being the party of small business, demonstrated under the last leadership. Chuka brought up his own family connection to the cause, his father having run a market stall, and related several times to the experiences of business owners on Streatham High Road in his constituency. He made a threepoint analysis of Labour’s relationship with SMEs. The first was that Labour, being the party of the working people, had to back the businesses that provide the majority of private sector work in the country. Secondly, SMEs provide high streets and communities with their unique character, so support for them is a fundamental part of Labour’s communitarian values. Finally, he pointed out that setting up a business is an act of challenging the market establishment. the government sought a deal with Nissan, pointing out that the future cannot be made on a business-by-business deal basis: whole sectors are reliant on the outcome of negotiations which he added are now predicted to take five to ten years. It is in this context that Mr. Esterson believes that Labour should aim “not just to be the party of small business, but of all business”. tephen Timms MP hosted a roundtable discussion on how the Labour Party can create and win the support of the next generation of entrepreneurs. The event was chaired by Martin Howe of the SME4Labour Executive Committee, with keynote speakers Stephen Timms and Bill Esterson MP at Portcullis House. selves and that this was an agenda Labour needs to get right. vaunted, but that it is a success with one company in one part of the country and definitely is not a plan. He argued that the target of 3 million apprenticeships is dangerous and that a rush will mean that there will be a loss of quality. He also stated that projections suggest there will be a deficit of 0.5 million jobs in intermediate and advanced-skilled areas including the construction sector. Important note: For two colour printing of both the logo and block logo, the logotype drop shadow is printed as 40% PW blueoverprintedon PW ed, r to give a‘dark red’ shadow effect, as with the CMYK version. WHILE YOU’RE THINKING BIG, WE’LL HANDLE THE SMALL STUFF. As international packing and shipping specialists, Mail Boxes Etc. has the expertise to make it happen. Shipping across the UK or around the globe is easy when you trust your packages to MBE. Choose from a range of Express and Scheduled services which allow you to balance speed with economy, helping you to reach new customers and suppliers wherever they are based. Worried about confusing paperwork or regulations? We’ve got the knowledge and technology to cut through all the red tape. ME4Labour organised a meeting in Islington between SME owners and Emily Thornberry MP. There were SME owners from various backgrounds who raised their concerns and other issues while also advocating for the Labour Party to become the natural home of small businesses, and that it should do more to engage with them. The key issues raised were lending to small business, immigration issues for the workforce, high rents and business rates. ctober 2015, SME 4 Labour along with Stephen Kinnock MP held a discussion with Rt Hon Lord Hain about life in British politics and the success of Lord Hain’s book Back to the Future of Socialism. The book highlights what the future holds for the Labour Party and its members putting forward a profound alternative to the neoliberal economic agenda. Lord Hain is best known for being a prominent activist in the anti-apartheid campaign in South Africa during the 1970s and for his later role in the Northern Ireland peace process. Having served the Labour Party for 50 years and been a cabinet member under both Tony Blair and Gordon Brown, Lord Hain is a true advocate for carrying through the policies brought in by the Labour Party. equal access to all the benefits of the welfare state and business system.” Angela Eagle MP expressed that a healthy relationship between the Labour Party and SMEs is essential because they “craft our policies so that we can build a prosperous economy for the 21st Century”. John McDonnell MP, also praised the organisation’s work to raise the profile of entrepreneurs and the self-employed in the party. Cooper said that SMEs shake things up and this is what the Labour Party is all about. She commended Ibrahim Dogus and Sonny Leong, co-chairs of SME4Labour, on what they had done and said their energy and those working with them in SME4Labour exemplifies the energy and drive of small businesses. Mr. McDonnell said that Labour can protect people and communities by investing in skills and supporting risk-taking entrepreneurs, adding that no community should be left behind. Ibrahim Dogus said that the Labour Party and SMEs are perfect partners. Mr. Dogus noted social justice cannot happen unless there is a growing economy. He said that Labour must be the party for all of those who want to be better off, to see their families get on, and that SMEs are the perfect engine for this. Sonny Leong said that we must never allow people to divide our country and that the Labour Party is the best way to make sure this does not happen. Mr. Leong said that SME4Labour is here to represent the views of small and micro businesses. Martin Howe, a member of SME4Labour’s executive committee, said that aspiration is a Labour value. Other guests and speakers included Dawn Butler MP, Clive Lewis MP, Baroness Angela Smith, Stephen Timms MP, Sharon Hodgson MP, Claude Moraes MEP, Jennette Arnold AM, and Rajesh Agrawal, the Deputy Mayor of London for Business. Mandate the new National Investment Bank, and regional development banks in every region, to identify where other lenders fail to meet the needs of SMEs and prioritise lending to improve the funding gap. Introduce a package of reforms to business rates-including switching RPI to CPI indexation, exempting new investment in plant and machinery valuations, and ensuring that businesses have access to a proper appeals process-while reviewing the entire business rates system in the longer run. We will also bring forward legislation for co-operative ownership. The National Investment Bank and regional development banks will be charged with helping support our co-operative sector. Labour will aim to double the size of the co-operative sector in the UK, putting it on par with those in leading economies like Germany or the US. Scrap quarterly reporting for businesses with a turnover under £85,000. Developing a version of the Australian system of binding arbitration and fines for persistent late-payers for the private and public sectors. We are Community. The modern union for a changing world. Weâ&#x20AC;&#x2122;re pleased to support SME4Labour to help create a growing economy and a better working world. Our members come from all industries and walks of life, but they have one thing in commonâ&#x20AC;&#x201D;they all want to get on at work, and to do right by their families. Weâ&#x20AC;&#x2122;re helping them reach their goals. We recognise the world of work has changed so we have changed too. We still represent workers in traditional industries but we are reaching out to new members, including self-employed workers, supporting people in emerging sectors of our changing economy. in London, Cambridge, Birmingham and Edinburgh. We have London Living Wage adopter. We advise national and international businesses and brands, charities and public sector organisations.